UNITY alliance has steadily, over the last few years, assimilated almost every other identity on the Minmatar side of the Minmatar/Amarr conflict. UNITY and their council are now the sole power holders in the Minmatar militia. This consolidation of power, has brought continuity and coherence to the Tribal Liberation Force (TLF). But at what cost, to the war effort, and to the line pilots? First, a small introduction and a measure of understand why I feel experienced enough to write about this topic. I am a long time player of EVE online. A Faction Warfare (FW) pilot since 2013 and an ex-Ushra’Khan member. I have fought with and against many of the largest organizations in New Eden, but the Minmatar/Amarr Warzone is where I call home. Back in 2013 Ushra’Khan <UNITY> were one of a number of alliances within the Minmatar faction warfare militia. Alongside Late Night Alliance <GHEY>, Iron Oxide <FEO>, Defiant Legacy <DFNTS>, White-Lotus <WL>, WINMATAR. <WMTR> to name a few. Since then, all of the above alliances have closed or in the case of WMTR defected to fight for the Amarrian side of the war. The TLF already controls the majority of the warzone, they have done for the past 5 years with intermittent pushes by Amarr forces. Some blitz attacks have resulting in huge swathes of the warzone being controlled by 24th Imperial Crusade (IC24). However, only for short and intensely hard fought periods. Between the two alliances (UNTIY and WAVE) they now hold and control. With grids full of citadels along the two main entrance and supply systems for the 24th Imperial Crusade Amarr forces it is a iron grip. Stifling the opposition through their supply routes, and cutting the Amarr off from their mission hub systems. Tactically this is smart and it’s war after all, but it seems UNITY’s far reaching hand of control will pull the trigger to shoot themselves in not one but both of their feet. UNITY are killing the warzone, they are suffocating the opposition and maintaining the Minmatar tier high at all times, devaluing minmatar LP to the point of worthlessness. They have become like the risk averse powerblocs of Nullsec space. They are ensuring their safety and financial security at the price of quality content and real value of income. Leading TLF members to fly further to find their PVP content that 3 years ago was on their doorstep. This on top of grinding 50% longer to achieve the same income that they would have 3 years ago. Furthermore UNITY alliance holds ratting space rented from a null group in the south east. Meaning that their inner circle is not reliant on the warzone for income like the many, many smaller corporations and alliances that call the Minmatar/Amarr warzone their home. This shows my sources is accurate in that they have truly become disconnected from their members, their militia, and most importantly their past. If any of the readers are active in the warzone what are your thoughts on UNITY and how they are currently operating? Are they pushing too hard at the expense of their members and the warzone as a whole? I’d hardly say Unity is suffocating the opposition. In the majority of small gang fights and system pushes, Amarr usually fights them off pretty easily, the only difference between the two is when Amarr takes the warzone, they lose it due to boredom and seeking content elsewhere. Whereas when Minmatar loses the warzone it’s simply because the Amarr groups are back in the warzone and wanting more LP. It’s pretty much the standard cycle of FW due to LP farming etc. which I’m assuming you don’t understand judging by this post. This post is actually pretty low-tier though, I don’t actually see what your point is and you’re the one who seems pretty disconnected from the situation. Someone had a lot of salt to vent it seems. Piss poor article – and that’s said putting my U’K bias aside. As a Newbro to the Warzone this is not how I see things at all. I also don’t believe our leaders want to kill off any opposing competition of the Warzone just to get rich. It’s the pride and devotion they have for U’K that keeps them fighting not the ISK. I have only been in UNITY for a little while but the opinion of the author of the article seems way off as this has not been the impression I have gotten from my short time as a U’K Freedom Fighter. (For example just the other night they commented on how they missed the pirate presence of No Handlebars) as the pirates actually provided more competition than the present Amarr factions. Winmatar was once a force to be reckoned with but there relevance diminished after they BETRAYED their Matar brothers. I mean seriously how do you expect to recruit Amarr pilots with a name like that? It should be a no brainer. Maidens of the Phallus (oops I mean Chalice). This is an amusing bunch of slavers. They seem persistent in activity and we enjoy their presence, but being a much smaller alliance it’s hard for them to pull the numbers required to challenge us in a meaningful way. Other groups and Random Amarr Militia. Varied and divided. For example the other night we were capturing the Labapi system. A few Winmatar and Maidens showed up which was nice, but easily defeated. Then there was also some random Amarr militia pilots one of which showed up in a Revelation. Now we didn’t manage to kill it but it did little to prevent us taking the system and was more of a distraction than a threat. Now imagine if all of the above banded together to put on a united front against our fleet. It would have been a much closer competitive battle. Our leaders even commented on how divided the Amarr resistance was. As for why should U’K not have an allie? It is after all the second oldest alliance in the game. It’s only normal for an alliance of that age to have at-least one allie, although it’s not like we depend on them. It’s more of a symbiotic relationship. Unity has spent the last few years working on all of the things that it takes to be a formidable organised militia. To suggest we should stop doing these things simply because we are the dominant force of the Amarr/Minmatar Warzone is silly. We would love it if more entities joined the Warzone and stepped up to the plate. Our leaders only want the best for FW and would love it if CCP gave it some much needed updates to revitalize this much loved part of the game. We (TMOCC) don’t really bother much with systems rn, much prefer to just massacre you nerds in arzad, which is probably the reason due to lack of resistance in labapi (And I was at work so meh). Regarding the divided front it’s not really the case, we’ve been working together with Winmatar for a little while now – Primarily shooting UNITY stuff. As you said TMOCC on our own have usually had issues fielding enough dudes to compete with Ushra’Khan, though this is solely on an alliance wide fleet level, though this is to be expected considering we’re just over a year old and you guys have been around since alliances were a thing. But yeah I don’t really know where this post is getting at, the only real thing UNITY has over Amarr is organised numbers, and even that isn’t enough sometimes (Moreso in regular day-day engagements). The main problem right now is SC dropping on everything that moves, which ofc is only natural being EVE, though like you guys I do miss SWEG, beings they understood the FW balance and had a tendency to watch FW based fights over things like citadels from the sideline to preserve some content. UNITY is a mediocre alliance at best who try very hard to keep it together and provide good fights, most of the time at bad odds for them. 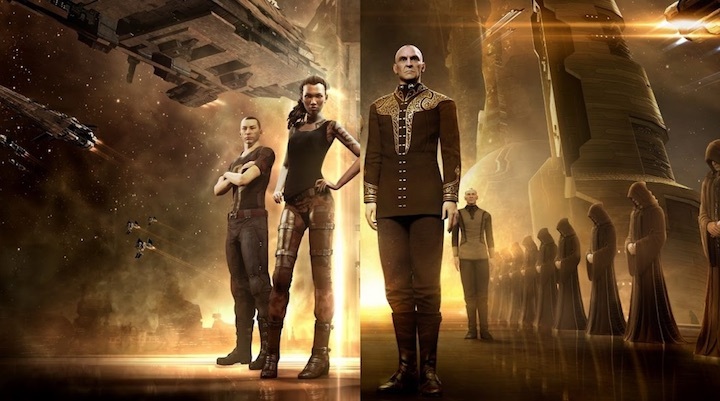 things like “stifling the opposition”, “risk averse powerblocs of Nullsec space” and “UNITY alliance holds ratting space rented from a null group in the south east” clearly mark this post as a yellow press propaganda tirade done sloppily. shame on EN24 for facilitating unadulterated trolling such as this. Obvious *insert minmatar defector name here* whining again…. I love Evenews24.com but every now and then a poor article like this passes along. Oh and about renting nullsec systems? Lies, yes there is a carebear project. But half of eve is alts, right? so it’s pleasant to read this webpage, and I used to pay a quick visit this website everyday. I’ve read stuff from. Thank you for posting when you’ve got the opportunity, Guess I’ll just bookmark this site. it’s time to be happy. I’ve learn this put up and if I may just I want to recommend you some interesting things or suggestions. What i don’t understood is in truth how you are now not really a lot more well-appreciated than you might be right now. when it comes to this subject, produced me individually imagine it from a lot of various angles. I just want to mention I am just very new to blogging and site-building and honestly enjoyed this blog. Almost certainly I’m likely to bookmark your website . You surely come with awesome articles and reviews. Regards for revealing your web-site. Nice post. I learn something new and challenging on websites I stumbleupon everyday. It will always be useful to read articles from other authors and use something from their websites. Hi! I simply wish to give you a huge thumbs up for the excellent information you have got right here on this post. I’ll be coming back to your site for more soon. Where online can an accredited psyciatrist blog post write-ups (or blog sites) for them to come to be preferred?